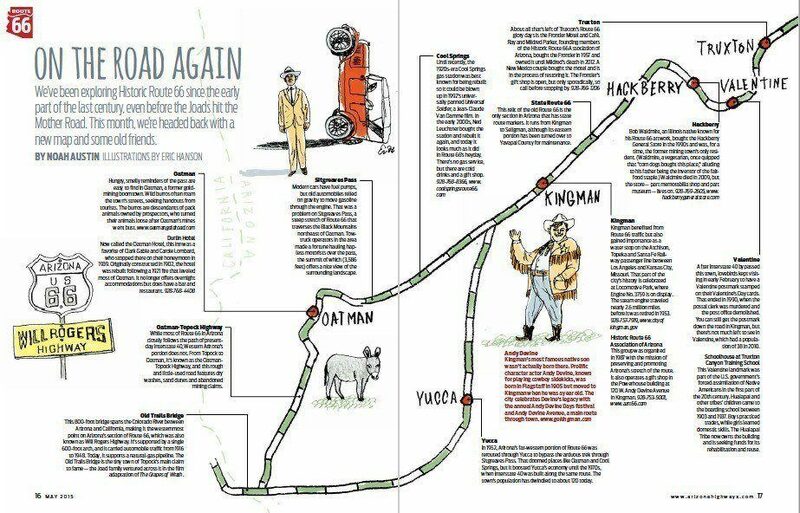 Eric Hanson's Route 66 illustrations have won a gold award from the International Regional Magazine Association. Hanson's work appeared in the May 2015 issue of Arizona Highways. The past weekend's International Regional Magazine Association conference was a big one for Arizona Highways, which picked up 20 awards for entries from the 2015 calendar year. The total continues an upward trend for the magazine, which won 11 IRMA awards in 2013 and 16 in 2014. Among the 2015 honorees were golds for David Muench, who won Magazine Photographer of the Year for our December issue; Eric Hanson, for his graphic accompanying a Route 66 feature in the May issue; and Editor Robert Stieve, for his monthly editor's letter. The other two golds went to Ben Coan, whose photo of Mooney Falls opened The Journal in October, and our April issue, which celebrated the 90th anniversary of Arizona Highways. The magazine also won seven silver awards, including for Annette McGivney, in the Magazine Writer of the Year category; for Scott Baxter's portraits of Clayson Benally (March); and for Craig Childs' essay The Long Deep Trails of Water (June). The awards were announced Monday at IRMA's annual conference in Fort Lauderdale, Florida. The organization was founded in 1960. Its purpose is to support and promote regional magazines in the United States and elsewhere. Arizona Highways has hosted the conference four times, most recently in 2012. We're very proud of all our winners. Congratulations! The full list of 2015 Arizona Highways winners is below. I live in the UK and wonder if I can buy your Magazine here. We bought it last year when on holiday down your way. I subscribe to National Geographic but can't find a site with Arizona Highways.